Your immune system normally produces antibodies in response to biological "tags" on invaders. These tags that antibodies find are called antigens. The immune system can recognize antigens on invading bacteria and antigens on your own cells—when they have become virus-infected or cancerous, for instance. When an antibody binds to its antigen, it can recruit the immune system to destroy the target. Monoclonal antibodies, or mAbs, are used to treat many different diseases, including some types of cancer. There is a lot of enthusiasm about mAbs and their potential to more selectively target cancer cells. Used together with chemotherapy, certain mAbs have lengthened survival times. Monoclonal means "just one clone," which requires further explanation. Normally, when your immune system sees an invader, it will develop a nice variety of antibodies—all different kinds, to target all different nooks and crannies on the invader's surface. These antibodies are polyclonal antibodies, meaning that several different "clones" or families of immune cells combine efforts to make an entire portfolio of antibodies to attack the invader. Scientists have become increasingly precise in fighting cancer, and targeting a bunch of different nooks, crannies and tags on a cancer cell might sound good, but is not necessarily practical. For example, what if one of the targets on a cancer cell turns out to be present in abundance on all normal, healthy cells too? Monoclonal antibodies, then, are artificial antibodies made in a lab by scientists—antibodies designed to target to a single, specific known antigen of interest—often a protein on the surface of cancer cells. Examples of mAb therapies for blood cancers include Rituxan (rituximab), and Gazyva (obinutuzumab), both of which target the CD20 antigen. CD20 is one of many different targets on the surface of B-cells, or B-lymphocytes, which give rise to many lymphomas. Naked or Unconjugated mAbs attach to antigens on the cancer cell, acting as a signal for the body's immune system to seek and destroy. Rituximab and obinutuzumab are examples of this type of mAb. They make use of your immune system to kill the cancer cells. They also lower the number of healthy B-cells, which have the CD20 tag, but healthy B-cells can be replenished. Conjugated mAbs bind to targets just like naked mAbs, but they deliver drugs, toxins, or radiation directly to the cancer cell. An example of a conjugated mAB is Zevalin (ibritumomab tiuxetan). Zevalin is a CD20-directed radiotherapeutic mAb for relapsed or refractory low-grade follicular B-cell non-Hodgkin’s lymphoma (NHL). It's also used for previously untreated follicular NHL with a partial or complete response to first-line chemotherapy. 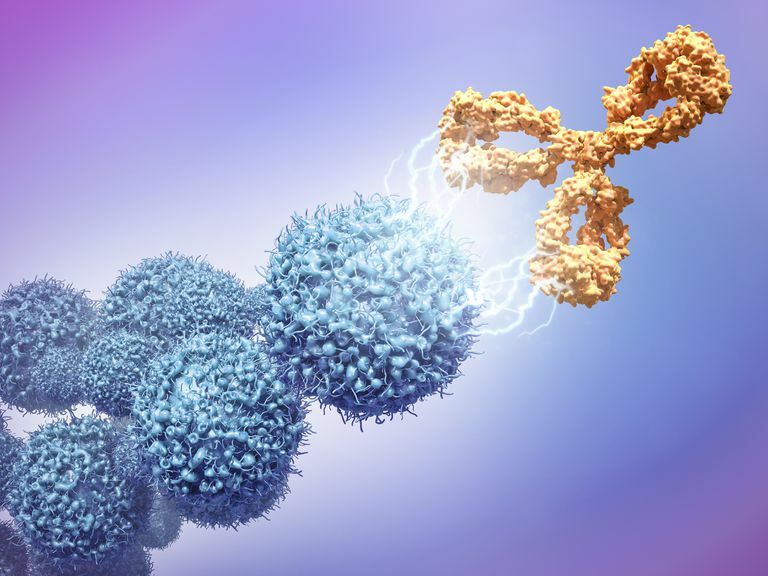 How Are Monoclonal Antibodies Given? Monoclonal antibodies are given intravenously, through a vein, in the hospital, or at the clinic. Other drugs may be given beforehand to decrease the likelihood of reactions and side effects. Importantly, when used as a treatment for leukemia or lymphoma, monoclonal antibodies are often given in combination with traditional chemotherapy. The number of scheduled times, or cycles, that a mAb is given in the course of treatment depends on a variety of different factors, including some factors that may be specific to you and your illness. Updated by Tom Iarocci, MD. Abernathy, E.(1997). Biotherapy. In Varricchio, C.(Ed.) A Cancer Source Book for Nurses -7th ed. (pp.379-390). Atlanta, Georgia: The American Cancer Society Inc.
Iarocci, Thomas. Blood Cancer and Anemia. NCCN. Patient and Caregiver Resources. Targeted Therapies. R.S. Cvetkovic and C.M. Perry "Rituximab: A Review of Its Use in Non-Hodgkin's Lymphoma and Chronic Lymphocytic Leukaemia." Drugs 2006 66(6): 791-820.